We enjoyed learning more about Eric Carle this week. We read many of his stories and learned more about him as an author and illustrator. The children enjoyed mimicking his style of artwork and created a flower. On Friday, we enjoyed Easter activities including a hunt. Congrats to the two coloring contest winners, Maddie and Leyla! Thanks to the Athletic Association for sponsoring! Click HERE to check out pictures from this week. It’s our last week before Easter break and we will be VERY busy! Reader’s Theater: this has been a big hit in kindergarten! We will continue to practice and act out our performances for eachother next week. Daily Journaling and partner pair sharing. Small group guided reading: we will put our reading strategies to work! Review of sight words: our final word wall was sent home on Friday. We practice these words daily during calendar, journal and center time. Practice reading and writing these words at home! We will make a Holy Week flip book, illustrating what happens on Palm Sunday, Holy Thursday, Good Friday and Easter Sunday. We will share bread with our friends, reminding us that Jesus shared bread with His friends on Holy Thursday. We will continue sharing kindness with others as we prepare our hearts for Jesus on Easter Sunday. 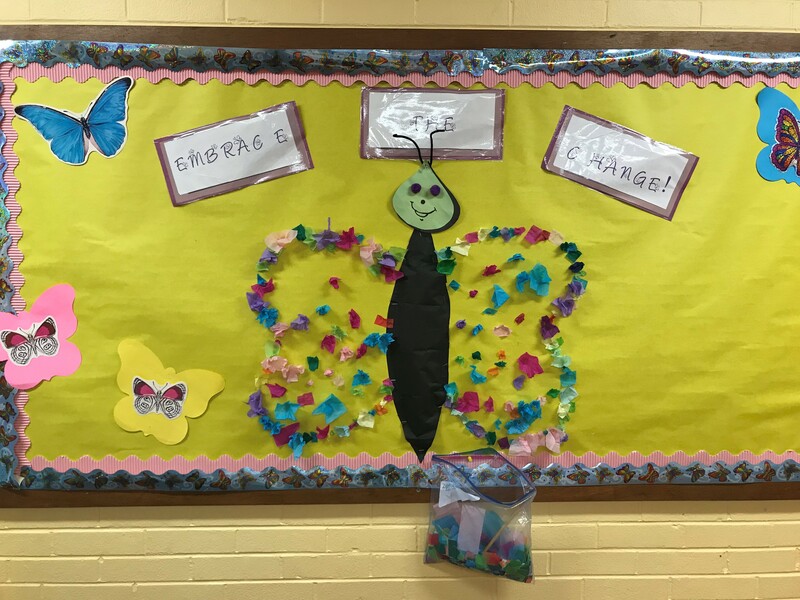 With each kind deed, our butterfly is becoming more colorful! We have finished observing our bean and popcorn seeds. When your child comes home with his/her seeds, please plant them in some dirt! We will plant some at school so we can continue to watch the growth. We will continue our observations. We will keep looking for signs of spring outside. We see new ones each day! Science experiments…with peeps! We will make predictions, experiment and go over the results together. Counting by 1s, 2s, 5s and 10s. Identifying and describing 2d and 3d shapes. Representing addition and subtraction with equations, written both horizontally and vertically. Measurement: length, width and weight.